I never get tired of seeing actor Will Smith, who turns 50 on September 25, play optimistic, good-natured heroes. The Philadelphia native is equally satisfying in action-adventure blockbusters and inspirational dramas. 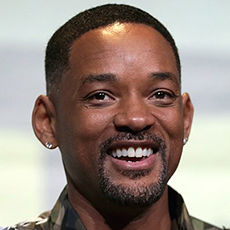 With star power that was evident way back when the sitcom The Fresh Prince of Bel-Air premiered, Smith is known for charisma, goofy laughs and engrossing escapes from reality. No matter the movie, Smith says, "I really am attracted to characters who just want to do things that brighten the world," according to Esquire's 2015 "The ESQ&A with Will Smith." With that in mind, here's a look at some of his best movies. When aliens attack the Earth in Independence Day, Smith's Captain Steven Hiller helps save the day. The movie, which won an Academy Award for best visual effects, features panicked people, eerie alien ships and exploding landmarks. It checks all the boxes for a summer blockbuster, action-packed disaster movie. In Men in Black, aliens disguised as humans walk among us. Smith partners with Tommy Lee Jones to monitor and cover up this alien activity, while also protecting Earth. The combination of Smith's Agent J as incredulous newbie and Jones' Agent K as been there, done that straight man makes for a fun comedy-science fiction-action movie. Chicago, 2035: I, Robot offers another chance to watch Smith save humanity, this time as Del Spooner, the detective tracking the case of a robot thought to have killed a human, the co-founder of a robot manufacturer. Does this spell robot revolt, or is there more to the story? The biopic Ali follows Smith as Cassius Clay from his first heavyweight championship through his conversion to Islam as Muhammad Ali, his exile from boxing and his return to the ring. Smith's intense portrayal of the legendary athlete and activist earned him his first Academy Award nomination. In Concussion, another biographical sports drama, Smith gives a powerful performance as Bennet Omalu, a doctor who uncovers connections between brain degeneration and playing in the National Football League. Omalu, a Nigerian immigrant, is targeted for his research, but Smith's portrayal bring his tireless fight to a wider audience. What's your favorite Will Smith movie?